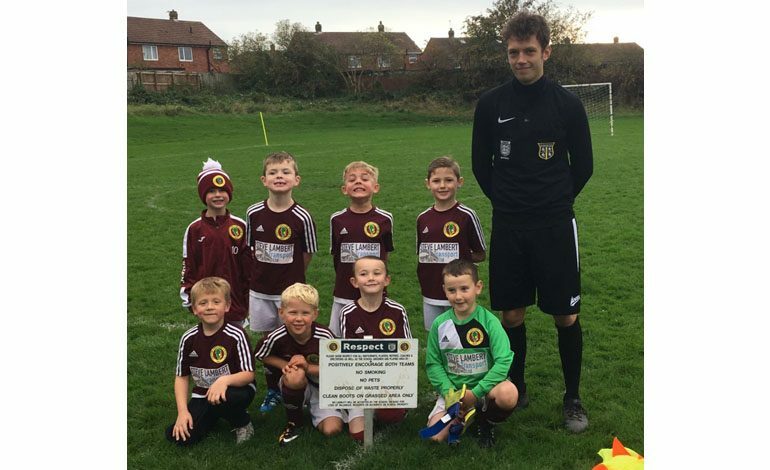 The Aycliffe Juniors football season continued over another weekend with matches for the majority of the clubs teams. The Under 6’s played only their second ever friendly game at home against Leven. They had a great time, Denver and Jack scored two goals each in a fine team performance. The Under 7’s played two friendly games against Wynyard. The first was drawn 3-3 and the second saw a superb comeback from 3-0 down for them to win 4-3. The Under 8’s hosted Stockton Town ‘Blue’ and after going 3-0 down goals from Thomas and Oliver (2) levelled the scores at 3-3. Goals were then exchanged between the teams with Thomas scoring again. Stockton though went on to win the match 6-4. Oliver was named as the Aycliffe man of the match. The Under 9’s (pictured) played at Sunnydale against Seaton Carew Tigers it was a tough game against strong opposition in windy conditions. Man of the match Harrison made some great saves in the Aycliffe goal but at half time Seaton were 4-0 up. A goal each for Kai and Harry in the second half was not enough to prevent defeat. The Under 10’s ‘White’ were due to travel and play Stockton Town ‘Yellow’ however their opponents were struck down with a sickness bug so the match had to be cancelled. The Under 10’s ‘Black’ played away at Greatham FC and started well with Jake getting the first goal and then Joseph scoring from Noah’s well placed corner. Man of the match Joseph completed his hatrick to make it 4-0 before Jake’s second completed a 5-0 win. The Under 11’s played at Great Ayton and they conceded two goals late in the first half. Man of the match Noah made a string of fine saves, including one from a penalty. Aycliffe pushed forward to get back in the game but conceded again. Thomas grabbed a consolation goal in this 3-1 defeat. The Under 12 TJFA league team hosted Golden Flatts and they maintained their unbeaten status with a great 8-0 win. Liam scored twice in the first fifteen minutes with both Charlie D and Charlie B then going on to add two goals each. Alex and Will scored later in the game to complete this resounding victory. The Under 13’s made the short trip to play Shildon and it turned out to be an exciting encounter. After going 1-0 down Clark held up play and set up Hume to score. Clark’s penalty made it 2-1 but Shildon equalised after half time. Another goal from man of the match Clark made it 3-2 but Shildon came back again to make the final score 3-3. The Under 16’s hosted top of the table Richmond Town and also drew 3-3. Dan’s free kick gave Aycliffe an early lead but Richmond equalised soon after. Stoker scored twice before half time, the first after a great ball from Pattinson. The score remained 3-1 with five minutes to go but the visitors earned a point with two late goals. The Under 23’s played a local derby at Sunnydale against Shildon and came away 5-4 winners.